If you are familiar with the law of attraction then you might also be well aware of the creative visualization process. I know a lot of people who find visualization a very tough task, some people are not able to visualize properly whereas some find it hard to stay consistent with the process. I have written a post “Don’t Say “I Don’t Know How to Use Creative Visualization”- You Are Already Good at It! “ which speaks about how our own beliefs makes it difficult for us to use our imaginative ability but, here I am going to talk about a different method which will be helpful for reprogramming your subconscious mind. If you were unsuccessful in achieving your goals using creative visualization and positive affirmations then this program might prove to be a great solution for your problem. In order to use the law of attraction for attracting your desired outcomes you will have to visualize the end results of your goals vividly along with strong positive emotions, so that your message could surpass the layer of your conscious mind make its way to your subconscious mind. A common mistake that we can find among people who are trying to apply LOA tools is that they fail to make a perfect picture of how their happy outcome would look like, because they get entangled in visualizing “how it is going to happen” rather than imagining the successful life itself. Our conscious mind loves trying to make things happen even though it has no control over it, this interference of our own conscious mind makes it difficult for us communicate with our subconscious mind. 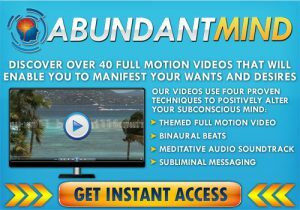 Ty Summers has created a very convenient method integrating success clips and technology to replace the old beliefs of our subconscious mind with the new better ones which he calls the Abundant Mind Visualization Videos. What Is the Abundant Mind Visualization Videos? These are videos created for making changes in a person’s mindset and feelings so that he could attract his desires successfully. All kind of results that we experience in various areas of our lives is due to our behavioral patterns that are governed by our subconscious mind. So, our subconscious mind runs the whole show. To make changes in our outer world we will have change our personal belief system, abundant mind visualization helps us to do that. Using four types of different tools viz. themed video, relaxation music, subliminal messages and binaural beats, Ty Summers has designed all abundant mind videos to make positive changes in the user’s old mind programming. From a large range of over 42 different videos along with the new ones added regularly you can select the one according to your requirement and watch it(wearing headphones) twice a day-Before sleep and after waking up for best results. Let it be financial success, better health or attracting a soul mate, their collection has videos for all those purposes. Since, it is important that the visualization process must accompany proper emotions to make significant changes in a person’s life, abundant mind videos gives high definition quality experience to users which naturally triggers positive emotions in them. The binaural beats and relaxation music puts a person in a perfect state of mind to deeply absorb the information that are presented in form of visuals and subliminal messages. Overall, I consider abundant mind visualization videos as a good program since it eases the process of establishing a strong connection between your conscious intention and subconscious response which is the basis of most of the personal development programs available today. With its very affordable price and refund guarantee, I don’t think one should take any decision without giving it a try. I would like to strongly advise the users to use it two times a day regularly for at least 3 weeks before expecting the results.